2 down and 13 to go! Time flies when you're having fun, and I can't believe I am already 2 years into my Early Retirement Plan. That’s a little over 13% done, 13 years to go, and in keeping with the 13's - I am unfortunately 13% behind were I hoped to be. I am disappointed, especially considering that 2017 was an above average year for markets. Oh well! Still plenty of runway left to try make it up. Let's take a quick look at the scorecard. The original plan said I should have started 2017 with around R990k, but my actual investments were worth around R898k. So I started 2017 with 9.29% handicap. I ended 2017 with R1 161 600.84 while the plan said I needed R1 335 210.37. I am around R175k (13%) from where I hoped to be. The long and short of it is I was not able to contribute the required amount every month during 2017 (I have really started noticing that stuff is getting expensive!) Fortunately, this was somewhat offset by some nice market returns. In truth I am probably going to be a little short in monthly contributions for 2018 as well, but I will be trying to get as close as possible to what I need to be contributing (I will hopefully write about some of my cost saving initiatives in the near future). Anyways here’s how 2017 played out. First up, this chart (click for larger image) shows my investment plan in grey, and then my actual investments in blue on a monthly basis. You can see the blue worm (older readers know him as Timmy) has slowly been losing ground with a noticeable downward blip right at the end (mostly due to Cyril giving the Rand a nice kicker). Timmy has now hit the terrible twos, so going forwards let's hope tantrums are thrown in the upward direction only! In the next chart you can see the percentage deviation of our planned amount versus the actual investment balance on a monthly basis. The deviation clocked double digits in the middle of the year, then recovered a little, but is now at 13% which is the most it has ever been. 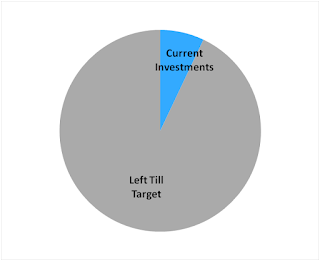 Whilst the pie chart above shows progress towards the final 2030 target, the below chart shows the value of my investments as a percentage of the amount I would need if I were to retire in the given year. The idea is that this should grow with each passing year and hit 100% at the end of 2030 (or in a perfect world even sooner!) Officially, I am around 15.6% financially free. And finally, I decided to add another chart (which I will also put on the FIRE Tracker page for monthly updating) which tracks how much income I could draw from my current investments, using the 4% Rule, versus the estimated monthly retirement expenses for the given year. Still a lot of daylight between the grey and the blue lines, looking forward to watching this gap narrow. I thought it would be interesting to also take a look at total portfolio asset allocation and how much of the our total portfolio is in various investment options. Below is a chart showing what percentage of our investments are in each “investment vehicle”. Charts for end 2015, end 2016 and end 2017 are shown below. I am liking the way the trend is going - more and more allocation into our TFSA’s (currently at 14% compared to only 4% at the start). In order to reduce our tax burden, I want our TFSA allocation to be as high as possible by the time I retire. On the flip side I want to reduce the weighting of my Government controlled investments - Pension and Preservation funds, currently 60% total weighting, but coming down slowly compared to the 62% of the previous years. These will take a tax hit once they are cashed out, and I will be forced to convert some of it into an A word.... (annuities). So while these have tax benefits now, there will be tax implications later. 2017 also saw the benefits of my companies share matching program starting to kick in. I did cash some of these out and moved them to other investments, but the allocation is still a little too high in my opinion. 6% in one company is a too high for my liking (single company risk - think Steinhoff). There will be some additional matching this year, and I will be taking some more out of my share matching plan to get the exposure down. A quick check on the actual asset allocation, as that can give some guidance on allocating funds going forward. As you can see, a quite light on offshore property, and international equities, and a little heavy on the local stuff. No need to panic and sell anything, instead I will slowly try pull the weightings towards where I want them by focusing this years' TFSA's purchases on offshore equities and offshore property. All dividends will also be invested in offshore property and offshore equities. The Bonds and Cash allocation, although unwanted, is unavoidable due to Regulation 28 rules on my pension and preservation funds. Slightly irritating having over 11% sitting outside of equities and listed property - damn you Reg 28! So that’s it for the second year of my Early Retirement Plan. I am excited to see what 2018 holds! I think I will be happy if I am able to keep the deficit between the plan and the actuals steady, and then hopefully recover it in future years. How did everyone else do in 2017?